Good grief if I don’t press the Publish button now it is going to be 2020, I’ve already rewritten this about three times and it’s not as if it is a work of literary genius. 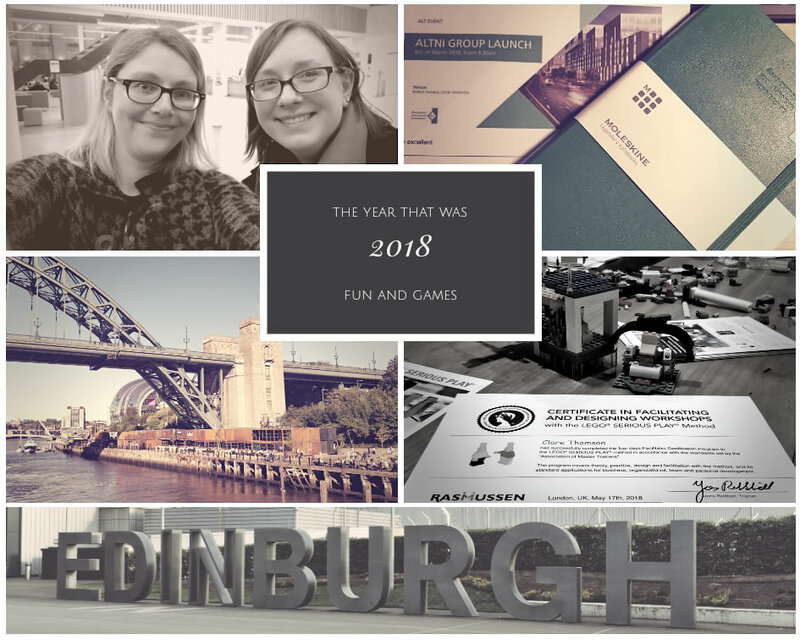 Looking back to this time last year I was reticent about doing a 2017 round up as it had been a pretty tough year. Thinking about it since I realise that it was tough mostly because I was exhausted; mentally and physically. This year had just as many downs, but that’s because I took more risks so perfectly natural not to win them all. It’s important to call that out, I love success just as much as the next person but the bumps in the road is how I learn best, more specifically bumps that come with quality feedback for improvement. The areas below are outwith the bread and butter of my role as a digital learning developer and perhaps somewhat odd, unlike my core work they mostly veer to the non-digital. Writing things down also highlighted how important getting outside inspiration is to kick start new developments – a breadcrumb trail in some respects, inspiration to implementation. There are four key strands but of course, nothing in life is that neat or tidy so there is overlap and leakage between them. Handing in my final open assignment was a massive relief, yet tinged with sadness as I had enjoyed all the modules immensely and would miss studying with such fabulous people across the globe. This lasted only a couple of weeks until I got official confirmation that my PhD application had been accepted by Edinburgh. My student days were set to continue into long into the future. I have written a couple of posts already about getting started but I need to get better at being more regular in putting down my thoughts. Not least since the topic is reflective practice! Other than getting started on my PhD in October the big highlight was making it to Edinburgh for graduation. Saying thank you to staff and meeting virtual peers was a lovely end to a two year journey. Seeing people who had traveled from far afield made me appreciate anew just how powerful online connections can be. It was also good to cheer on all those who were attending the ceremony virtually. The Association of Learning Technology (ALT) played a significant part in my year not least as we launched the Northern Ireland Members Group in March, on International Women’s Day. Maren gave an inspiring keynote to cut the ribbon so to speak – you can watch all the speakers and read up on the day over on the ALT NI website. In addition, we met up to virtually to attend the main ALT conference in September and set up a NI cohort of CMALT candidates for the coming year. This is especially exciting as ALT generously gave us 5 funded places in parallel with the Irish Learning Technology Association (ILTA). Lots more to come this year on that. Maren also inspired me to get involved with #femedtech, and I curated the account for two weeks in November. This was a privilege and lots of fun, being a totally different persona for a few days. The year got off to a great start as I got news that I was successful in my bid for an INMED Travel Grant. This was the final piece needed to be able to book my place on the LEGO Serious Play Facilitator training in London, in May. The whole four days were packed with learning and fun. It was exhausting but definitely worth all effort to get there. Learning the full scope of the methodology was mind blowing as to date I had been scratching the surface. The workshops that I have facilitated/designed since have all been influenced by the experience. I redesigned the medical student welcome workshop to focus on their motivation to become a doctor and weaving in support structures. Increased confidence led me to add a new element to a staff version in which I gave each member of the team an additional secret challenge that they had to stick to throughout the group build, giving a new dimension and atmosphere to the room. I facilitated workshops internally and also presented the work in Newcastle at the Association for the Study of Medical Education conference. Last October, I attempted to defend creativity at a distance and personally felt that I hadn’t succeeded. Not the type of person to leave an itch be, I jumped at the chance to do a virtual LSP workshop for the ALT Winter conference having seen a demonstration of the MashMe system, by colleagues. Barring a couple of glitches (one failing MacBook and one obstinate version of Chrome) the workshop flew past in a blur of connected creativity. We didn’t even manage to fit in the third task. An outstanding way to end the year and stopping the itch for good – the tweet below is now filed safely away in my professional development Happy File. The year ended with a publication of our work to date with medical students, which had the added sweetness of being my first as primary author. In March, the Centre for Educational Development hosted a webinar by Ewan McAndrew, Edinburgh’s Wikimedian in Residence, and the seeds were well and truly sown for me about using Wikipedia within education. I reached out to our subject librarians and asked if they would be interested in working together to design and deliver a year 3, three week module around Wikipedia. The underpinning teaching was centred on digital and information literacy with a non-disposable assignment of editing Wikipedia. The first run was a success and we are halfway through the second. Hopefully, I’ll be sharing more about this at #OER19 in Galway. Connecting up with the subject librarian has been a whole new collaborative experience but to top it all off I contacted Rebecca O’Neill, Project Coordinator for @wikimediaIE, to tell her of our plans and she offered to come up and facilitate the getting started as an editor workshop, super fantastic. To date she has been to visit us three times, twice for students and once for a staff version. Outside, or even within these four headings two key elements of the year really stand out for me. Firstly, writing, so much writing. Thousands and thousands of words, which for an academic or researcher is probably the norm but as a developer this was definitely over and above the norm. Assignments, applications of all descriptions, reflections, papers, proposals… This seemed to peak in December so maybe a writing overload has resulted in my avoidance this month so far (compounded by Christmas flu). Secondly, and probably more importantly, I asked people favours. I’m an introvert so tend to avoid cold calling but I made 2018 the year of pushing myself right out of the box and surprise, I didn’t break. No one said ‘no’ and in every case it lead to excellent things. From paper bags to coffee vouchers, to book signings, to speakers; everyone was incredibility open and generous. Knowing that connections are key and actually acting on that knowledge are entirely different beasts and I am so grateful to everyone I tapped over the year. Thank you all. All in all it was an exciting year, filled with new projects and collaborations. Several things didn’t pan out but in the main they fed the things that did work out. Juggling it all with family and moving house required a lot of additional energy and I absolutely promise myself that this year will include more self care, whatever the heck that means. The year is already looking exciting with a whole new set of targets, goals and changes. The wider world is still at odds with itself in many ways and the future seems very precarious but fingers crossed someone is going to see sense and return us all back to the heady days of ok and boring. CC-BY Clare Thomson. Unless otherwise stated this work is licensed under a Creative Commons Attribution 4.0 International License.